LG Electronics' G Pro 2 has a bigger screen than its predecessor, but improved video and camera features are what the company hopes will make the device stick out from the competition. For LG's smartphone division 2013 was a good year. The company sold about 46.4 million devices, compared to 25.8 million during 2012, according to market research company Gartner. That was enough make it the third largest smartphone manufacturer in the world, a spot it shares with Huawei, Gartner said on Thursday. But the company can't afford to rest on its laurels, because the next ten months promises to be even more competitive than last year. With the G Pro 2 LG hopes to outcompete products like the Galaxy Note 3 from Samsung Electronics and Sony's Xperia Z Ultra. 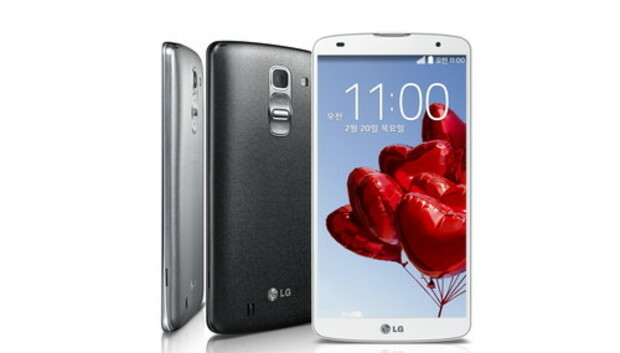 LG's newest LTE smartphone runs Android 4.4, has a 5.9-inch Full HD screen and is powered by a Qualcomm Snapdragon 800 quad-core processor clocked at 2.26 GHz. It also has a 2.1-megapixel front camera and a 13-megapixel rear camera with optical imaging stabilization. There is 3GB of RAM and 16GB or 32GB of integrated storage, as well as the option to expand storage capacity using a MicroSD card slot. Its predecessor, the G Pro, has a 5.5-inch Full HD screen and is powered by a 1.7 GHz quad-core Snapdragon 600 processor. The G Pro 2 is about 8 millimeters longer and 6 mm wider than its predecessor, but also 1 mm thinner. Users who pick up the new model get a slightly larger removable battery, 3,200 mAh versus 3,140 mAh. Smartphones launched with improved cameras throughout last year, and LG is continuing down that path with the G Pro 2. The company's optical imaging stabilization technology combines software anti-shake functionality with a hardware-based feature already built into the camera module for better photos and videos when in motion or in low light situations. The flash has also been improved and sensors and lenses of the front and rear camera have increased in both size and sensitivity to further improve image quality, LG said. The LG G Pro 2 lets users shoot HD videos at 120 frames per second and 4K content. A feature called Magic Focus lets the user select the preferred depth of focus before saving, LG said without elaborating on how the feature works. To control the phone, LG has stuck with buttons on the back and users can still knock on the screen to unlock it. The smartphone is launched in Korea this week, and will be on display at Mobile World Congress at the end of the month. LG didn't say when the G Pro 2 will become available in other parts of the world or what the device will cost.